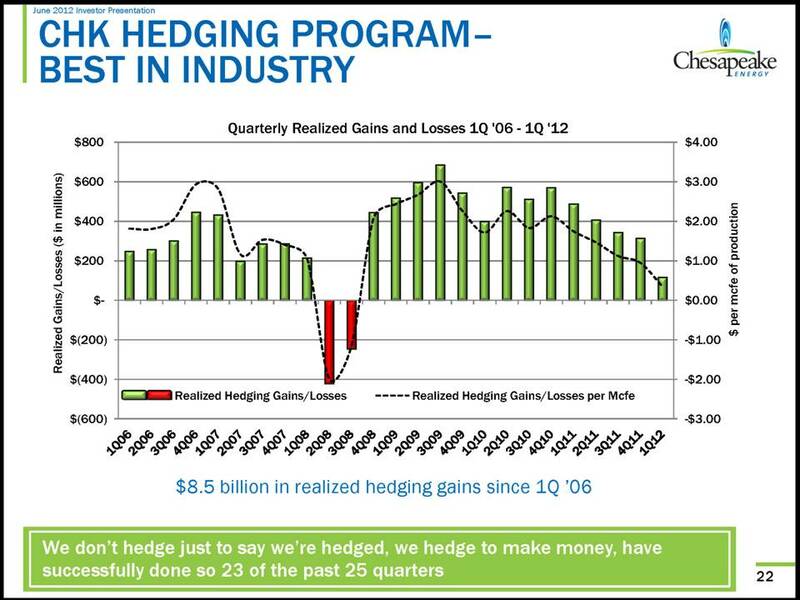 You know something’s awry when management is crowing about the hedging operation being a valuable profit center. Are speculations on price really one of Chesapeake’s core competencies? Of course a look back at the ex post realized profit on a hedging portfolio is a bad way to evaluate performance. A hedge is designed to sometimes earn a profit, and sometimes earn a gain. Chesapeake is naturally long gas, and its hedge portfolio should be short. The years shown in the slide cover many swings in the price of gas, but overall capture a drop. A plain vanilla hedge would have earned a profit over this period, while the underlying business of producing natural gas underperformed. The results shown don’t demonstrate any special prowess at divining the direction of prices. Chesapeake’s management has a special reason to make noise about the profitability of its hedging operations at this critical moment in time. That’s because it took a big gamble on price last fall that hasn’t gone well and that is contributing to the current cash squeeze. As explained by CFO Nick Dell’Osso during Chesapeake’s Q1 earnings call, the company temporarily removed its hedges hoping to profit off of an anticipated short-term run-up in the natural gas price. That left the company exposed. And the price didn’t behave as predicted, leaving the company worse off than before. The hard part about hedging is keeping one’s eye on the ball. The task is to reduce risk by taking bets that offset the bet embedded in the underlying business. Ex post the hedge may make gains or may make losses, but that should never be the measure of hedge performance. The measure of hedge performance is the precision with which those gains or losses mirror or offset the results on the underlying business. Once management forgets that, once it focuses on the hedge profits themselves, it is inevitably pulled away from tailoring the hedge to the needs of the underlying business and instead begins to manage the hedge as a speculative operation all on its own. The company suffers twice: first, by losing the value of a well crafted hedge, and second, by wasting resources on ill informed trading. This entry was written by John Parsons, posted on June 11, 2012 at 5:28 am, filed under commodities, hedging, speculation. Bookmark the permalink. Follow any comments here with the RSS feed for this post. Post a comment or leave a trackback: Trackback URL.